Nitin A Gokhale, Co-founder, BharatShakti.in and long-time Rediff.com contributor, remembers a most unusual politician. Our first conversation began with a misunderstanding. In January 2015, I was in Baroda when an 'unknown' number flashed on my mobile. Thinking it was a friend from abroad whose number normally doesn't show up, I greeted him exuberantly expecting a similar response. Puzzled, I rather curtly replied: 'Who Manohar?' 'Parrikar,' the caller added. It was India's Defence Minister Manohar Parrikar. He had personally called. From his own mobile. No PA, no exchange, nobody holding the line. He had simply dialed directly. 'I want to meet you,' he said in a matter of fact tone after I had apologised for being slightly rude in my initial reaction. 'Don't say sorry. We have never spoken before and my number doesn't flash. How would you know who is calling,' Parrikar pointed out and immediately put me at ease. I told him I was away and would return to Delhi in the next couple of days. 'Done. Let's have lunch on Sunday. I am staying in Kota House. Please come there around 1230,' Parrikar told me. And just like that, my short but memorable association with Manohar Parrikar begun. I was puzzled and to be honest, also flattered that India's defence minister wanted to meet me. I was intrigued because at that point in time, I was at a loose end having left NDTV in December 2014. I was not an important editor or an influential journalist, yet he wanted to meet me. 'What could he possibly want from me?' I kept thinking over the next two days since Parrikar had not mentioned any agenda or subject for our meeting. Hours before going to Kota House (the naval facility where he was staying since a Lutyen zone bungalow was yet to be allotted to Parrikar), I banged out a one-page suggestion sheet in bullet points, highlighting what I thought were key issues in the ministry of defence (MoD). At Kota House, I was ushered in straight into his suite. A smiling Parrikar, dressed as usual in his trademark open bush shirt and trousers, instantly put me at ease. I had heard many good things about his simplicity, his open approach. In fact, my friend Tejas Mehta, who was then the Mumbai bureau chief at NDTV, had specifically asked me to meet Parrikar in November 2014 when he took over at defence minister, mentioning that he was very approachable. However, I had no real reason to meet the new defence minster since I was quitting full-time journalism around the same time. All this came back to my mind in a flash as we sat down. After a moment of awkward silence on my part, I tentatively offered him the one-page sheet I had typed out. 'But tell me, why does the MoD function on a principle of mistrust?' Taken aback at the rather direct remark, I asked asked him to elaborate. 'In these two-three months that I have been here, the most striking aspect I noticed is the all-pervasive atmosphere of suspicion. Everyone is looking over his or her own shoulders. There is very little coordination; the overwhelming tendency is to first say no to everything,' a visibly agitated Parrikar explained. I was astonished at how quickly a newcomer like him (no previous experience at the Centre) had gauged the work culture in South Block. 'It has been like this for decades,' I concurred. What can be done to improve the system?' was Parrikar's next question. 'Well, there are no ready made solutions,' I added. 'I will call you again to discuss something that I have in mind,' he said, 'but let's not keep the fish waiting, gesturing towards the dining table. That's where I first got a glimpse of his legendary love for fish. As we finished lunch, another point I noted was the ease with which he interacted with his personal staff. Upendra Joshi and Mayuresh Khanvate were among the two most trusted of his personal staff. They also ate with us, sitting at the same dining table. Later I knew why. When he trusted a person, he trusted him or her fully. No half measures. As weeks went by, we met more frequently -- always at his initiative -- since I had insisted that I will meet him only when he wanted. Gradually, his calls started coming daily. He was hungry for new information, fresh insights. I provided whatever I could with my limited knowledge. 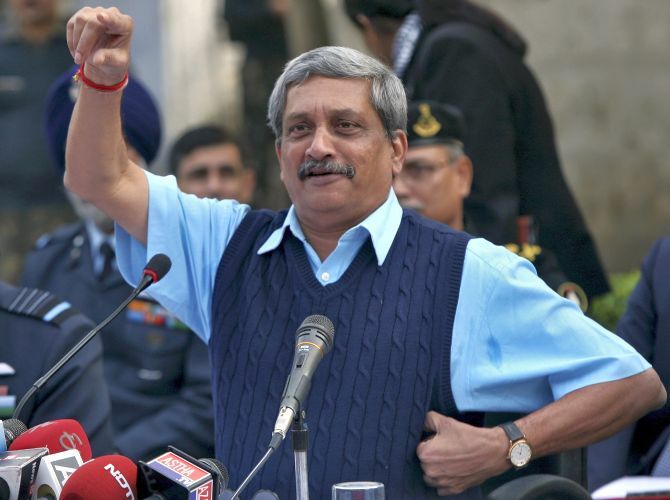 One day, Parrikar said he wanted to revise the Defence Procurement Procedure (DPP). 'Give me some names of experts who can revise, rewrite and simplify the procedures,' he told me. So I suggested half a dozen names. He chose four of them for the committee that eventually wrote the DPP 2016. It had many revolutionary ideas and Parrikar's stamp was very clearly visible. He overcame stiff opposition from within to introduce a new category for procurement in the MoD called IDDM -- Indigenously Designed, Developed and Manufactured -- products giving them top priority in acquisition. I dare say that the improved transparency in the MoD and the willingness of top officials to meet and explore collaborations is the lasting legacy Parrikar has left behind at South Block. As months went by, he started calling me home at 10, Akbar Road. Sometime early morning at 7, many a times after 10 pm, after he had finished with his official work. At night, he would inevitably share a beer (Bira had become his favourite) and ruminate, bounce off ideas and sometimes express his frustration about the obstacles he faced in the system. So much so that even when I went off to Honolulu for the 40-day Advanced Security Cooperation Course at the Asia-Pacific Centre for Security Studies in September-October 2015, he would occasionally call from his staff's Whatsapp number just to chat. By the middle of 2015, he had understood what could work in the murky world of defence, and what could not. However, he was never comfortable in Delhi's culture of sycophancy. His bungalow was open to everyone, but fixers and influencers. So I had to be doubly careful since word had spread about my unrestricted access to India's defence minister. I must have blocked at least 14 or 15 numbers in the period that Parrikar was in Delhi because people of dubious credentials wanted to use my closeness to him. I would inevitably tell him about who I had blocked. In November 2015, I launched BharatShakti.in. I wanted to begin with a detailed interview with India's defence minister. But somehow, he couldn't find time to sit for an hour or more. When I started breathing down his neck as the deadline neared, he said come to Goa. So one fine day, we boarded his official Embraer from Dabolim airport. For the next two hours, I recorded a freewheeling chat with him. The result: His most detailed interview ever, which was also published on Rediff.com. In fact, it was so detailed that most of what he said translated into policy one by one as months went by. The most astonishing aspect of that two-hour plane journey from Goa to Delhi was the fact that he never referred to a single piece of paper. Everything was at his fingertips. His phenomenal memory and eye for detail was clearly evident during that interaction. Parrikar was also a voracious reader. It was titled Victory on the Potomac by a Pentagon insider detailing the battles that were won and lost in the American political arena before the Goldwater-Nichols Act was promulgated. 'Give me your opinion on what could we borrow from here for India,' he told me, signalling the intent for creating jointness and integration of the three services. Both those books are still with me. In fact, the day he vacated his bungalow, he carted all his books to Goa Sadan and three weeks later asked me to pick and choose what I wanted to take home. I brought home about 60, 65 books. Now they will remind me of him, each time I pick up any one of them to read or refer to. I was always curious about his journey from IIT Bombay to politics. He narrated a very revealing anecdote about how it all began, but suffice it to say once he decided to take the plunge, he was a natural. Parrikar knew how to extract the best out of a diverse set of people. He was loved, respected and followed blindly by Goans for over two decades. He had his faults, of course. For one, he hated to decentralise or delegate. Calling him a control freak would be an exaggeration, but because he was a perfectionist, Parrikar preferred to do most of the work himself. He also, therefore, did not or could not groom a second rung political leadership in Goa. He could also be very acerbic when he wanted. Parrikar carried the zeal that had made him such an adored leader in his own state to Delhi, but the workload at the MoD was enormous. So he would invariably wake up at 4 am and not sleep until 11 pm. The punishing routine and the fact that he worked all seven days a week (five days in Delhi and two days in Goa), took its toll. He was practically running the MoD and the state of Goa simultaneously. When in Delhi, he would miss the informal Goan way of life. He had to behave formally as defence minister most of the time. But when Parrikar felt he had to unwind, he would suddenly call and ask if I was in Delhi and free. If I said yes, he would ask me to request my wife to cook simple, home- made fish curry and rice and tell me to keep a couple of bottles of beer in the refrigerator before he arrived. For the next 90 minutes or so, India's defence minister used to regale us with anecdotes from his personal life in his typical witty style, forgetting all the burden that he carried on his shoulders. We in the family too developed such a close bond with him that none of us felt he was an outsider. For us, it became an accepted fact that Parrikar would drop in at home without much notice. Now, looking back, we have suddenly realised that we don't even have a single photo with him in our house although I have many snaps with him at public functions. As I write this, my eyes well up and thousands of memories come flooding back. 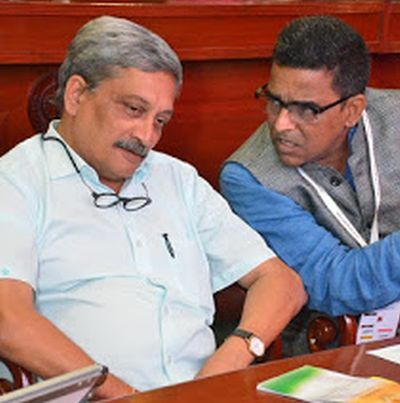 I am an emotional jumble at the moment, but even when I look back after some months, I am sure I will feel the same way about Parrikar -- Bhai to everyone in Goa, but like an elder brother to me in the two years that I got to know him so closely in Delhi. To say we will miss him is to state the obvious, but for me the bigger loss is for India as a nation. You went too soon, Manohar Parrikar. You will remain an inspiration for life. The biggest lesson I draw from your life is to remain humble, no matter what heights you reach.